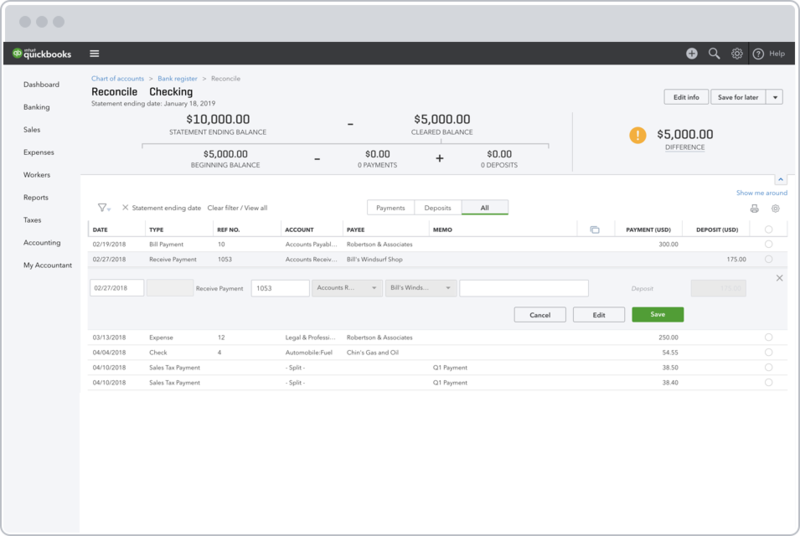 Reconcile bank statements in minutes with QuickBooks. Save time on monthly reconciliations with QuickBooks. Reconciling a bank statement is an important step to ensuring the accuracy of your financial data. To reconcile bank statements, carefully match transactions on the bank statement to the transactions in your accounting records. With QuickBooks, you can easily reconcile bank accounts to ensure that the dollars you record are consistent with the dollars reported by the bank. Connect QuickBooks to your bank, credit cards, PayPal, Square, and more1 and we’ll import your transactions for you. When you receive your bank statement or account statement at the end of the month, you’ll only spend a minute or two reconciling your accounts. 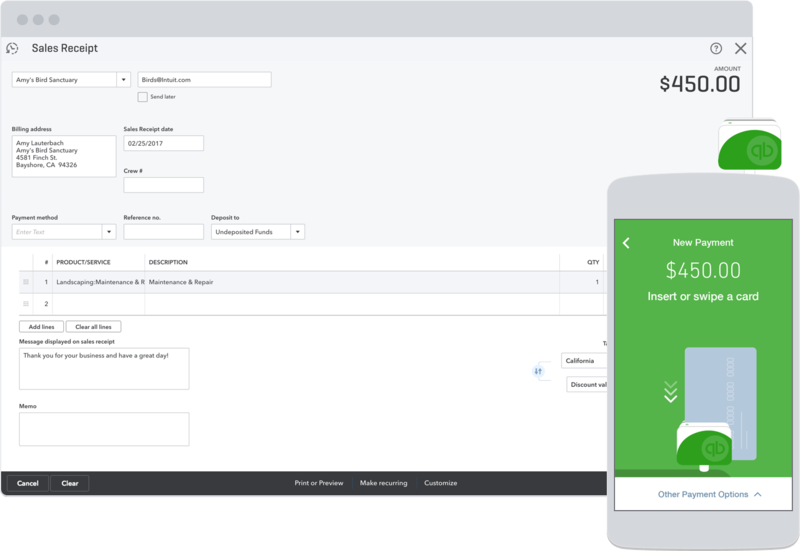 QuickBooks organizes your data for you, making bank reconciliation easy. 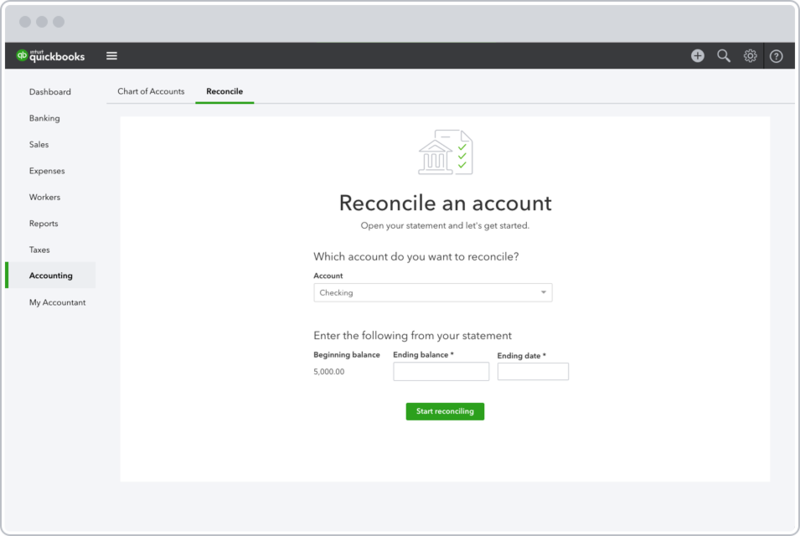 In QuickBooks, choose the account you want to reconcile. With bank statement in-hand, you can systematically check off matching transactions one-by-one by clicking their boxes. The bottom of the screen contains a running total of items you have checked off, and thus have been reconciled. This is useful for comparing the totals in your books to the totals on your bank statement. To complete the reconciliation, make sure the difference shown is zero. All the features you need for fast bank reconciliation. When you finish reconciling accounts, QuickBooks automatically generates a reconciliation report. It summarizes the beginning and ending balances, and it lists which transactions were cleared and which were left uncleared when you reconciled. This report is useful if you have trouble reconciling the following month. Discrepancies happen. With QuickBooks, you won’t waste time spinning your wheels. There are several reports – such as the The Reconciliation Discrepancy Report, the Missing Checks Report, and the Transaction Detail Report – that can help you identify discrepancies quickly. Give your accountant direct access to your books so she can find the reports and information she needs when questions arise. Create a separate login for your accountant to make it easy for her to work with you. You can exchange messages and share documents directly inside QuickBooks, too. More than bank reconciliation. Run your entire business with QuickBooks. Accept payments with QuickBooks. Give your customers the option to pay via credit card, debit card, PayPal, or bank transfer. QuickBooks processes the payment and transfers the money to your bank account. There’s even a mobile card reader so you can swipe or dip the card from your phone or tablet. QuickBooks has time-tracking and payroll features built-in. Employees log their hours, you review and approve them, and QuickBooks does the rest. 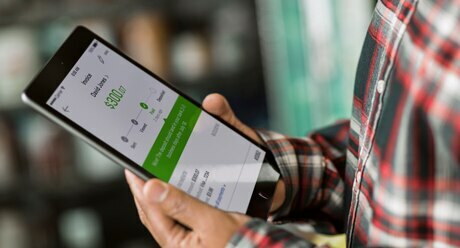 Cut checks or pay employees via direct deposit, issue W2s at tax time, and file taxes electronically – all from QuickBooks. Easily run financial statements that show exactly where your business stands. Access your cash flow statement, balance sheet, and profit and loss statement in just a few clicks. Schedule reports to be generated and emailed daily, weekly, or monthly. The bank reconciliation process is similar to balancing your checkbook: It reveals any erroneous or missing entries so you can be confident that your cash balance is correct. Here are the steps to follow. Businesses should reconcile their bank accounts within a few days of each month end, but many don’t. Learn from these 10 common accounting mistakes to make improvements in your business. Keeping your financial records in order is hugely important to the success of your business. Read the steps you should take when closing out your small business’ books for the end of the fiscal year. Why would I find discrepancies between QuickBooks and my bank statements when I reconcile accounts at the end of the month? There are a few reasons your QuickBooks data may not match your account statements, including bank service charges, checks that haven’t cleared, and transactions that haven’t been entered in QuickBooks yet. How much time will I save by reconciling accounts in QuickBooks compared to my current manual method? On average, manual reconciliations can take up to an hour. If you connect your bank to QuickBooks, it usually takes less than 10 minutes. Can I adjust a reconciliation in QuickBooks? Yes. We know that taking hours to find amounts that are off by a few pennies doesn’t make sense. In QuickBooks, you have the option to make an adjusting entry if the difference isn’t zero when you are finished reconciling. However, adjusting entries should be made only as a last resort for small amounts. If you adjust larger amounts, you risk creating issues for the future.